Although the general public won’t have access to “Strikeforce: Diaz vs. Daley” tickets until Saturday, ‘Strikeforce Insiders’ will be able to purchase their seats today starting at 1PM ET/10AM PT. The April 9th event will be jumping off inside the Valley View Casino Center in San Diego, California. A pair of championship scraps will headline the Showtime broadcast. 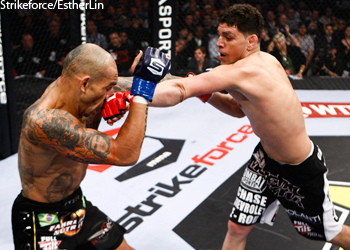 Lightweight king Gilbert Melendez will put his crown on the line against Japanese star Tatsuya Kawajiri in the card’s co-featured contest, while welterweight champion Nick Diaz defends his belt against Paul Daley in the night’s main event. ‘Strikeforce Insiders’ can buy their tickets today beginning at 10AM PT through 10PM PT on Friday, March 11th. The public will have access to the remains on Saturday at 1PM ET/10AM PT. Tickets start at $25 each.